Richard was the first person I knew who got sick. It was the early 80’s and my gay community was soon to know the suffering of the yet-unnamed disease in the withering body of our friend and the valiant efforts of his lover to keep him alive. This was not just Bill and Richard’s story. It was all our story, and it was about to get much worse. We felt as though there was an invading force, gaining strength and coming closer with each moment. Every day there was a call about a friend in the hospital who needed to be visited, someone who was missing, for whom we feared the worst. The memorial services increased in frequency as the months and years tumbled uncontrollably forward. For years, there seemed to never be enough time to grieve the loss of one friend before another had died. And honestly, while grateful for all the advances that have been and need to continue to be made, it never got “better” for many of us – in the ways we longed for the most. I didn’t live during the bravery and sacrifices of our World War generations. I was twelve when Addie Mae Collins, Cynthia Wesley, Carole Robertson and Denise McNair were killed in the bombing of the 16th Street Baptist Church in Birmingham. I reeled at the same age as John F. Kennedy was assassinated three months later. I was in seventh grade in Catholic school in the Bronx, NY; we cried and prayed in the face of the unthinkable murder of a president. I thought the world was ending. It couldn’t get worse. Yet, it did. In February of 1965, the hatred claimed Malcolm X’s life by an assassin. Three years later, Martin was shot in April of 1968; two months later in June Bobby was murdered. I just remember feeling like this couldn’t be true. Yet it didn’t go away with the morning light. I didn’t want to be angry; I didn’t want to give up; I didn’t want to stop believing in what was quickly unraveling. I wanted to believe in God and Country and others. And there wasn’t much we could do at the time, other than go to school, go to church, pray for God’s intervention, and watch the adults for cues and some indication that this would pass, somehow…some way. But, by June of 1969, the year I graduated from high school, the same year and month of the Stonewall Riots in Greenwich Village, “life” became very personal. I was of age, and I was about to start living through a revolution in which I was to be intimately present and involved. That’s not to say I was out or active in those early days, but I knew this was about folks like me. Yet, none of what had preceded those early days in 1982 prepared me for the HIV/AIDS Crisis. None of us saw the advance of the silent enemy AIDS and its counterpart – AFRAIDS, the latter that turned people away, praying for our souls that we might repent before we burned in hell – and at all costs making sure sure to keep their distance. Gratefully, so gratefully, there were many who stayed with us, especially our sisters who were always there. The Lesbian community and many families were always by our side, whether in our homes, visiting us in hospitals, or in advocacy and protests/marches. And, often with us were some of those same nuns and faith community leaders who lived into their faith in stunning ways. And, yes, there were the others who wagged the familiar fingers of damnation. The echo still rings clear: “God loves you, it’s just your sin that God hates.” I always know why I recoil, even today, when I hear those words; words that have never symbolized the teachings of Jesus and the Gospel that I follow or any teachings of any faith tradition that I know. Yes, we have come a long way since the days when we called the disease GRID. We have come a ways since GMHC first began, and Act-UP brought us advocacy and action, and medical advances have made HIV/AIDS largely a chronic illness rather than a death sentence. But as with wars, societal upheaval or any revolution – judgment is written in how we have changed our world and our lives. How have these trials changed our ways of knowing one another and God, by whatever names God may be known – or not? And, as a final marker of our time: How have we advanced in finally eradicating hatred, marginalization, and violence from this planet? However, forgetting those who have gone before? Not walking with and missing the company of those we have lost, suffering the absence of the contributions stolen from our world, whether on the battlefields of war or the biology of disease – that and more we will always have to live with. That can never get “better” – but it can move us forward, living into the memory and lives of those who have gone before and struggle today – so that a difference – a big difference can be made. In 1993, two mothers in California began Until There’s a Cure, an organization to raise funds to help fight HIV/AIDS. They sold a cuff bracelet with the ribbon on it. It was a symbol that said we would never forget our sisters and brothers we had lost, those living with HIV/AIDS or those who might soon contract the illness. 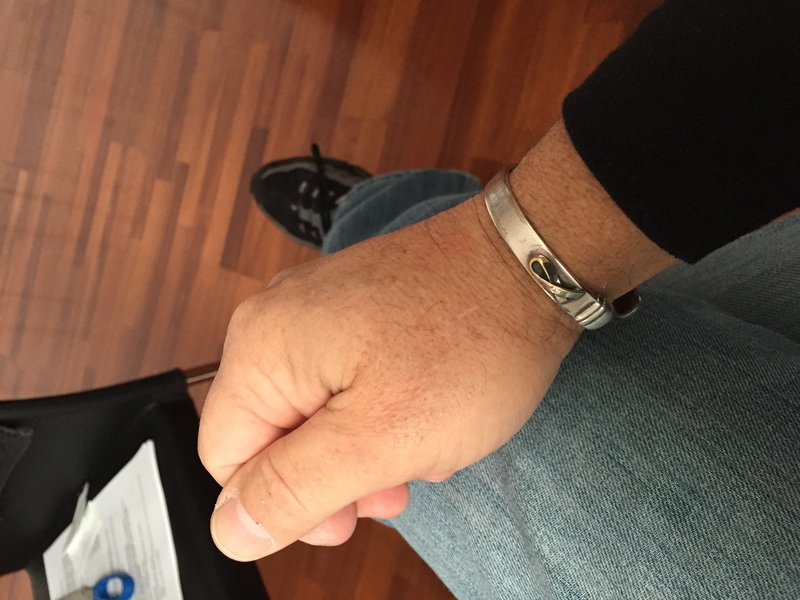 It was a commitment for many to wear the bracelet – until there was a cure – and to do what we can in the meantime. 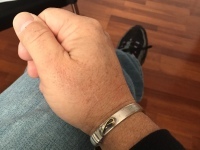 Twenty-one years later mine is still is on my wrist, reminding me that over thirty-four years since Richard died — every day is World AIDS Day — until it is no more.